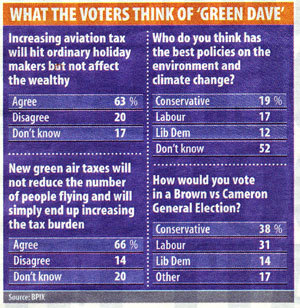 Both the Mail on Sunday and Sunday Times have surveys on voter attitudes to green taxation. The idea of such taxation gets a big thumbs down but David Cameron is - overall - seen as greener than Gordon Brown and the headline Tory lead over Labour is intact at 6% (YouGov) and 7% (BPIX for the MoS). By 42% to 36% there is support for building more nuclear power stations. The Mail on Sunday/ BPIX numbers are summarised in the graphic on the right. The overall Tory lead with Brown in charge does not really justify Jonathan Oliver's "Cameron's green tax on air travel a massive voter loser" headline. Despite the unpopularity of green taxes the Tory lead is stable. It may be that the lead would have been larger without the green tax controversy and it might be that a campaign by airlines/ Labour against levies on flights could yet do damage to the Tories. It is also possible, however, that the controversy has helped Cameron to address some voters' perception that he will 'say anything to anyone.' On both the family and green taxation he has recently chosen to stake out positions that are either controversial with opinion-formers or with large sections of the electorate and the overall effect of this might be to suggest that he is a politician with core beliefs - not just a weather vane. What voters cannot stand is hypocrisy and news that David Cameron took a ninety mile flight from Oxford to Hereford just two months ago makes the Tory leader vulnerable to the 'do-as-I-say-not-as-I-do' charge. Labour's John Healey MP said that "it just shows that Cameron believes there's one rule for him and his Tory friends, and another for the rest of us." The Sunday MIrror is also accusing Mr Cameron of hypocrisy after going through his rubbish bins and finding unrecycled cardboard, plastic and nappies. Related link: 18 Doughty Street's climate hypocrisy video. Gaffes like the internal flight and unrecylced cardboard are just the sort of thing that make the whole thing look hollow. Can DC really fly anwhere at the next election or will he have to go around on some form of bus driven by chip fat recylced from school kitchens? It could be a hard campaign if he has to cycle from marginal to marginal. I think the graphic is worrying - 52% don't know means "don't care" and the airline tax is unpopular and seen as a failure as people think it won't stop flying. The environment is not a big policy in the country - maybe at London dinner parties it is, but in the country other real issues matter. The environment may be a real threat, but it is like Hitler in the 1930s. The government know it is, but the people prefer to think everything is going to be ok, because the true situation is too horrible to comprehend. In the 1930s people believed in the League of Nations and disarmament - today its documentaries on C4. Have to say that Cameron does need to be careful that he "walks the talk" - but also that there is a more damaging story for Labour that I think the BBC would have highlighted if positions reversed - the ties between current ministers and a lobby firm run by ex minister abnd ex-labour functionaries. If it had been Tories tied to Lobby firm and Gordon Brown doesn't recycle/flies 92 miles I think I know which the BBC would have had on its news summaries and followed up on Panorama etc. A story in this morning's Telegraph appears to be trying to make the green tax issue even more unpopular. Any active investor knows that, short of global nuclear warfare, the worst problem to blight markets is uncertainty. Courtesy of Tony Blair, it is uncertainty above all else that is currently blighting the Labour Party. When the new Labour leader is elected, whoever he may be, that major adverse element will vanish. Whether other negative perceptions of Labour will disappear in Blair's baggage train (as, apparently, happened with the Tories when Thatcher went) remains to be seen. However, what is absolutely certain is that all bets are off until Blair goes. Don't tell the Camerloons, though. It would be such a shame to rain on their parade. How hilarious to hear the Tories proclaiming themselves to be the saviours of the NHS! We all know that most Tories hate the NHS as a socailist relic and would abolish it if they could get away with it. The fact that its creation in 1948 was opposed by every single Tory MP says it all. As a thirtysomething who grew up in the 1980s amidst crumbling schools and decrepit hospitals, I think some of your more youthful correspindents have sought to vanquish historical facts just becuase they're not old enough to remember them! Putting the Tories back in charge of the NHS is too frightening to think about. If you think things are bad now, you ain't seen nothing once they get their grubby hands on this natiinal treasure! "We all know that most Tories hate the NHS..."
No, you like to think that the Tories hate the NHS. This blog carries all manner of "Conservative" opinions but not once have I ever read anybody argue here to close the NHS. I'm a Tory. I don't hate the NHS, I would defend it right down to the wire. I do hate the bad management, the endless paperwork, the consultants hired to come in and clean it up and then make things worse, the layers and layers of useless and inneffective middle management, etc etc. What our Socialist friend 'BW' - another afraid to post under his actual name - is confusing is that a desire to manage the NHS effectively is not the same as hating it. It's a desire to make it better, and improve what is, I agree, a National Treasure. the ties between current ministers and a lobby firm run by ex minister abnd ex-labour functionaries. The fact that its creation in 1948 was opposed by every single Tory MP says it all. It is Labour lunacy since 1997 that has wrecked the professionalism - it was Labour that took medical training away from the GMC and then started to shorten Consultant training - and it is Labour that encourages physiotherapists to train at University only to find themselves unemployable in an NHS short of physios. You see bw you don't understand that Labour sees the NHS, and other public services, as for the benifit of politicians. Tories have old fashioned ideas that the NHS is for the benefit of patients and have run it as long as Labour. Oh yes, and in the 1980s Labour had recently left office. The figure that stands out in the BPIX poll is the 17% given to others. This has increased fatser than the Tory lead. If the trend continues, the minor parties could swing the results of a GE all over the place. Do we need to have TomTom's foul language? Can you not warn him about it Tim, or at least delete his posting? I am one of those increasingly familiar types - a diehard Conservative who is wondering how on earth he can compromise him princples and follow Cameron. The tax on flying was a badly thought out policy initiative that should have flown by a Tory junior, not the leader. How on earth could you police the taxing of people's flights. If I knew I was going to be taxed more for a longhaul, I would buy a shorthaul to, say Amsterdam, and then buy another ticket from there. Or I'd get my mum, who never goes anywhere, to buy it on her credit card. The whole thing is blinking stupid, and not worthy of a Conservative Party leader. And now, having read Rod Liddle's interview with Patrick Mercer in today's Sunday Times, I am seriously thinking of ditching my Conservative Party membership. The trouble with Cameron and crew is that they have no ideology. All they want to do is get into power, and they don't mind dropping all Tory principles in order to do it. Well it might be okay for them and their careers but there ain't nothing in it for me. This kind of quaint tribal loyalty, which might have seemed almost normal even 20 years ago, now seems as odd and outdated as a set of Directoire knickers. I continue to pay my subs (and do precious little else) through simple inertia because the alternatives on offer don't appeal. Maybe I am fooling myself in supposing that the Conservative Party will ever return to Conservatism, but Matt and others are most certainly deluding themselves if they believe that the public, even in its current anti-Labour mood, would ever sympathise with, or even begin to understand, atavistic Tory loyalism. What is so curious is that those who are most affected by this syndrome are often those who claim to be most "modern" in their political outlook. "This blog carries all manner of "Conservative" opinions but not once have I ever read anybody argue here to close the NHS." I have argued to privatise it. Is that the same thing? Couldn't agree more with Alex, above. Inertia is the word. A political party needs a distinct ideology in order to stir its supporters into actively supporting its activities. Cameron's "say anything in order to get elected and then we'll try to be Tories" approach simply doesn't wash even if the Conservative party faithful think that that is what will happen if the Tories win the next general election. For a start, Cameron will have gone too far down the no tax-cut route and if it will be tricky for him to turn to the right. And anyway I am beginning to think that Maude, Letwin, Vaizey and co. are really closet Blairites who have absolutely no intention of leaving the centre path. The whole thing is utterly depressing, and all so dreadfully dishonest. As I retire to bed (early start Momday AM and snow on the way) I am shocked that TomTom has been allowed to use such foul language on this site - Tim, you usually insist in high standards, don't let things slip. His bad manners have been commented on before, nothing was done and now he is using profanities. I'm just about to settle down and watch The Great Global Warming Swindle to see what that does for my attitudes!